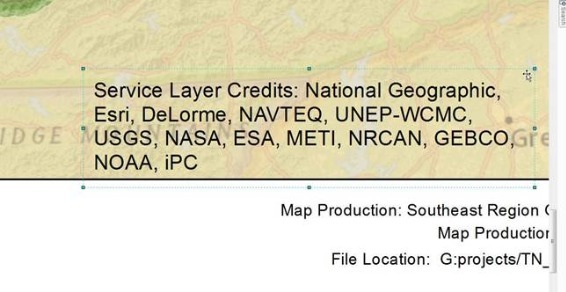 Are you tired of the credit information from the ESRI online basemaps displaying in inconvenient locations on you map compositions? 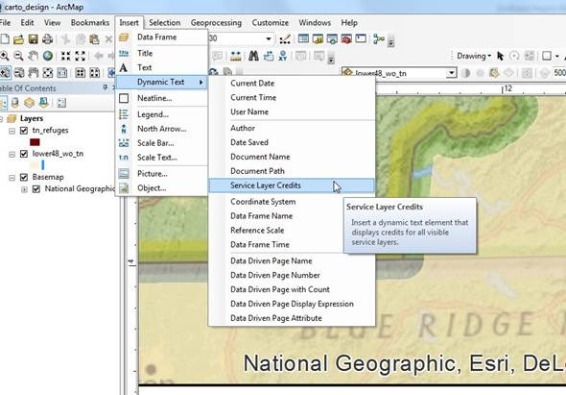 Here’s a way to control the text: From the insert pull down menu, hold your cursor over the Dynamic Text option and then select Service Layer Credits. The Service Layer Credit text that was imbedded as part of the image is now free floating and editable. Of course you are thinking “Hey, I can just delete it.” Not so fast. If you delete the text it reverts back to displaying as part of the image. But, now you can change all of the characteristics of the text and placement. We want to give credit where credit is due. We just don’t want it detracting from the design and message of the composition.